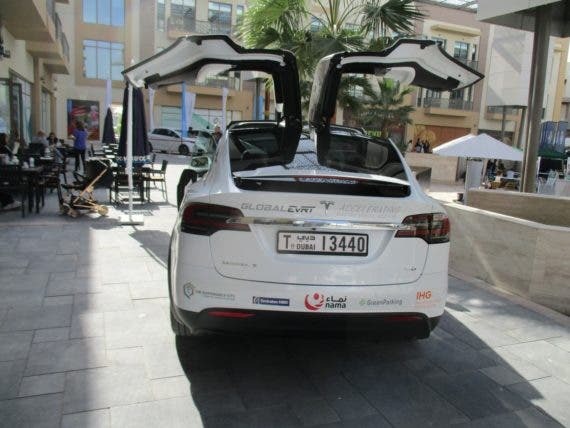 I have just returned from a week of driving a fleet of Model S sedans, a Model X SUV, and an array of Chevy Bolts in the United Arab Emirates as part of the 2018 Global EVRT event. What follows are my personal impressions and not intended to be a scientific inquiry in any respect. My opinions may or may not jibe with your own. I know in advance the Tesla folks will take issue with some of what I am about to say. So be it. I had never been in a Tesla before. I found the Model S and Model X to be big and comfortable (great seats!) with more than adequate power. An afternoon in the back seat of a Model S was not pleasant, however. The car was lacking in rear-seat legroom — surprising in such a large car. I also found the opening for rear-seat passengers was much smaller than I expected, which made getting in and out a chore (I have the same issue with the Mercedes C-Class sedan, by the way). The ride, especially at the back, was a bit harsh in my opinion. I was exposed to a Model S P100D in Ludicrous mode briefly. It was exhilarating but I can’t say I understand why anyone needs that much power in a road car. Some will be offended if I say I think the whole thing is ludicrous. You can spend $100,000 on a wristwatch, too, but why? Obviously, I am not someone who feels the need to have such an expensive bauble on my charm bracelet so others can be envious. From my perspective, the Model S 75D was a fine car and would be more than adequate for my needs. Driving on the highway with Autopilot engaged is a joy. The traffic-aware cruise control and I never got in sync, however. Most of the driving I did was on a two-lane highway with lots of lumbering trucks in the right lane. The absolute speed limit in the Emirates is 120 km/h (75 mph) and all cars activate a chime above that speed. I tried to be a good citizen by sticking to the speed limit, which meant pulling over to the right to let others go by on many occasions. Then the cruise control would abruptly slow the car to the speed of the trucks ahead before I could find an opening in traffic to move back into the left lane. I’m sure there is a way to adjust that, but when you are driving an unfamiliar car in an unfamiliar country in a convoy with little opportunity to pull over and read the manual, you work with what you’ve got. If I were driving in the US, I would simply have stayed in the left lane and kept up with traffic. 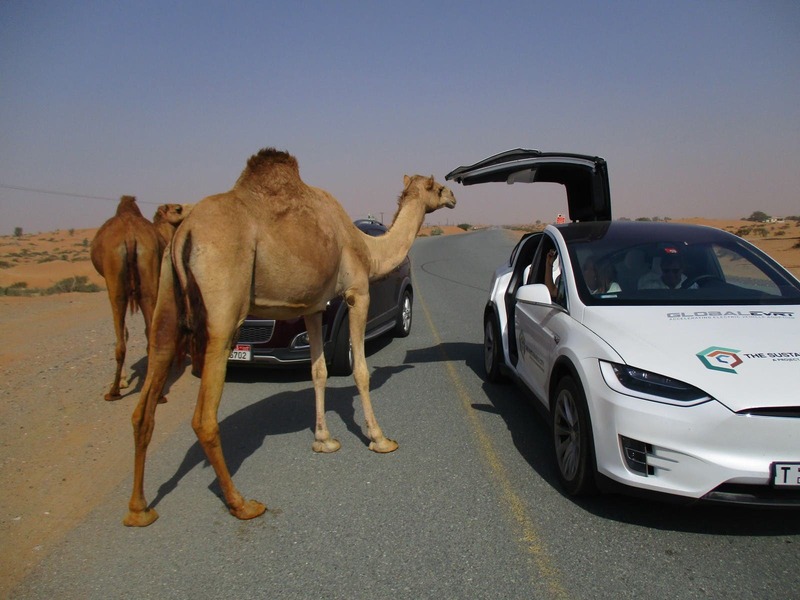 The Tesla does get attention, though. Everywhere we went, other drivers were tooting at us and taking videos while driving alongside. 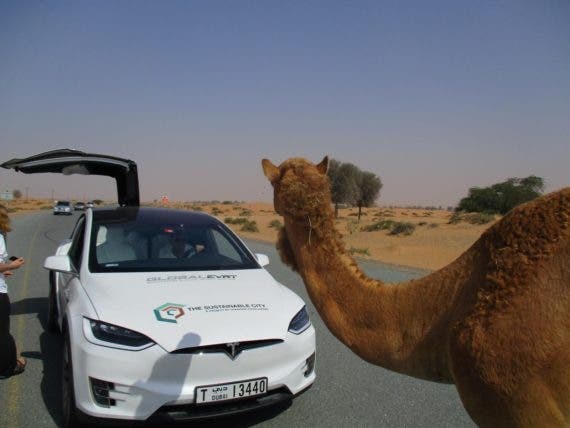 When we stopped, the Teslas attracted crowds (including camels) while the Chevy Bolts in the group were largely ignored. Most people didn’t seem to realize they were electric. At the ceremony marking the end of the road trip at The Sustainable City in Dubai, one young fellow climbed behind the wheel of the Model X. 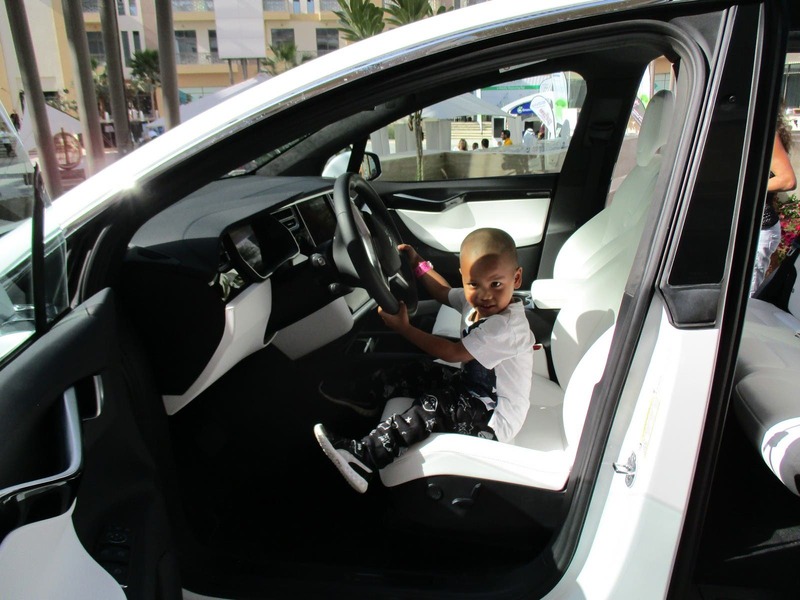 As I was taking his picture, his father told me, “I am a visionary. This is the car I see my son driving when he grows up.” He may well be right. I rather enjoyed the Chevy Bolt — more than I thought I would, actually. It has a shorter wheelbase than the Teslas but more room inside. It is not trimmed in Alcantara leather, but the interior is tastefully done. 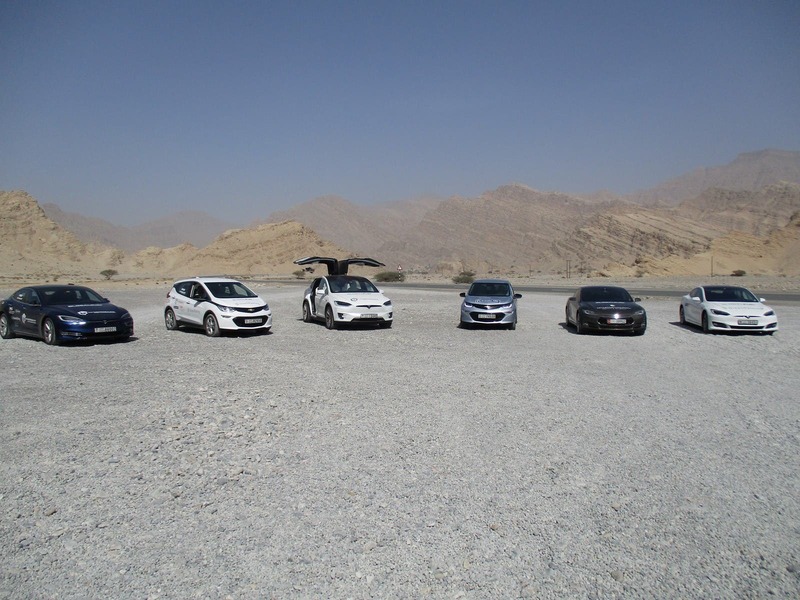 The seats are comfortable, the ride is supple and well controlled, it handled the switchbacks on the road to the top of Mount Jais with aplomb, and it has more torque than most people are used to. In short, the Bolt succeeds at being a car that someone driving a Honda Civic (like me) can jump into and feel instantly at home. It asks for no compromises, which I’m pretty sure is what the engineers who designed it were hoping for. 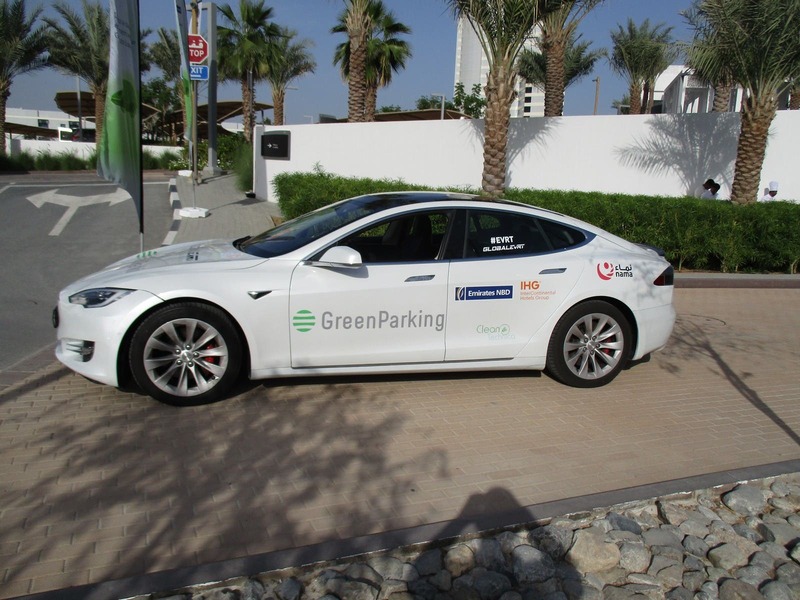 The Tesla is full of gee-whiz doodads and features that take some getting used to. The Bolt feels completely normal in a way the Tesla does not. There are some downsides to the Bolt. The lower half of the dashboard is done in an off-white material. When you look at it closely, it is embossed with tiny squares, but once you sit back in the seat, it looks like styrofoam. Chevy should ditch that detail immediately. It makes the car look cheap. 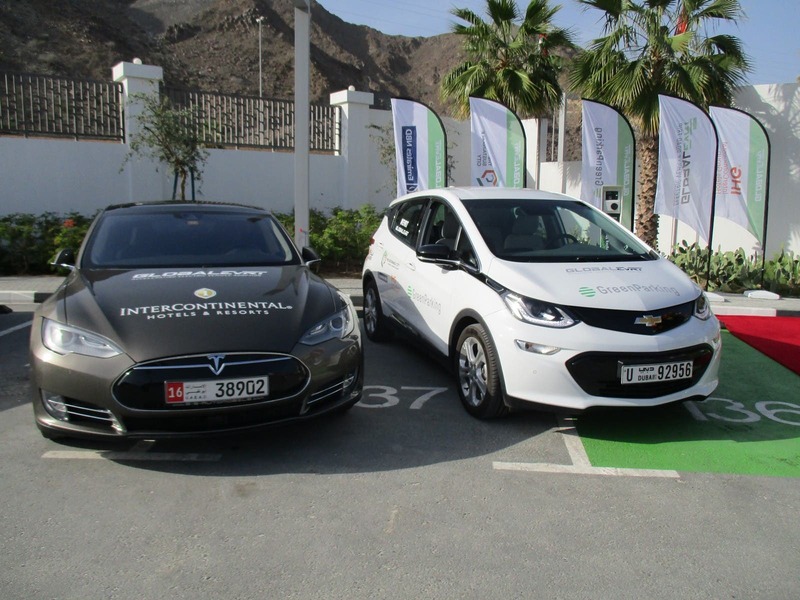 A second strike against the Bolt is that while it is compatible with Level 2 charging equipment, it can only accept 7.2 kW of single phase power, which means it will take longer to charge than a vehicle that is compatible with three-phase electricity. Chevy is trailing rather than leading in that regard. Time to raise your game, lads, if you want to be a serious contender in the EV market. On balance, I found the Bolt was more “me.” I was more comfortable driving it. It is a mainstream electric car for mainstream drivers — the people who buy boatloads of Civics, Golfs, Corollas, and Elantras today. It is not as pretentious as the Teslas, so it doesn’t get quite the accolades the Teslas do, but for my money, the Bolt would be the electric car I would buy. 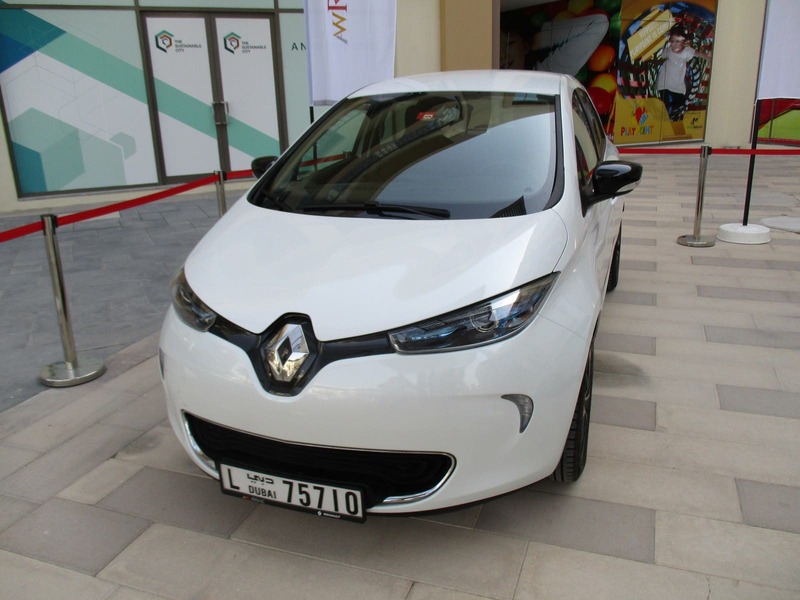 I got to spend all of 30 seconds sitting in a Renault Zoe while at The Sustainable City. This is a car that is not available in the US, so I know little about it but I can report that, at first glance, the interior is more appealing than the Chevy Bolt. It seemed very tidy and well thought out. 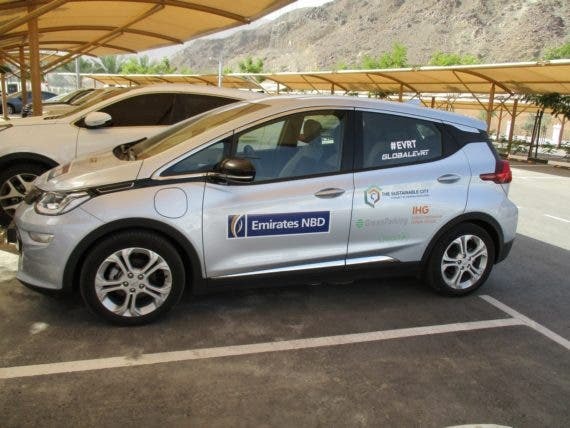 In my opinion, the Zoe is the car people in the UAE will cross shop against the Bolt, not the Tesla. If I were a Chevy product manager, I would study the Zoe closely. Based on a very short introduction to the car, it does some things better than the Bolt. As Ronald Balit of GM UAE told me during the road trip, it is just as important to keep an eye on competitors moving up from behind as it is to focus on the frontrunners. The Zoe is setting sales records in Europe. GM would be wise to figure out why. See full Renault Zoe review here.